Competitively priced offering excellent value for your dream holiday. 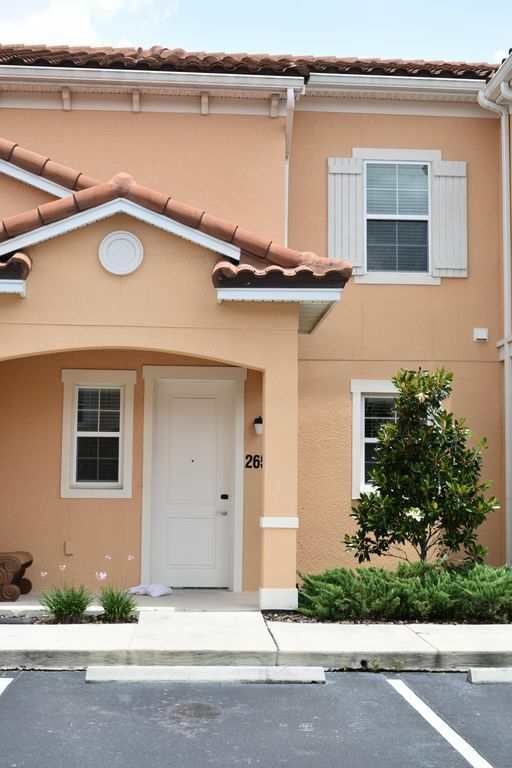 Welcome to Regal Oaks, a home-from home gated community offering space, comfort and privacy for you to enjoy your Florida holiday at your own pace. Located in an ideal setting, just a few miles away from the world-famous theme parks, you have no excuse not to get out and explore the fun and thrills that Orlando has to offer. Located at Kissimmee this popular resort is only 6.2 miles from Walt Disney World Resort and 12.7 miles from the Universal Orlando Resort making journey time to the parks no problem. Other attractions include the Orlando Vineland Premium Outlets just a 16 minute drive and only 9.3 miles from SeaWorld, plus the popular and beautiful Celebration only 1.9 miles away with shops and dining options so plenty to enjoy. Your holiday home offers a well appointed, modern town house with accommodation over two floors. With free parking at your door the property is access via a secure entry code. The ground floor consists of a comfortable family room with dining area and a fully, well equipped kitchen and convenience of a half bathroom. Facilities include a flat screen TV, DVD player, free WiFi and telephone use for local calls. With a modern fully fitted kitchen which has everything required to make your stay pleasurable. The private, completely netted patio offers all the comfort to enjoy family time together. Relax on the sun loungers or in your own ‘Hot Tub’. First floor fully carpeted accommodation is accessed by a stairway and comprises of a master double bedroom and a generous twin bedroom, both benefit from good sized en-suites. Further sleeping accommodation is provided by a full size sleeper sofa located in the family room. Regal Oaks offers much to enjoy with a beautiful pool, supervised children’s play pool and recreation area, gym, restaurant, bar and convenience store. Half Bathroom comprises of toilet and wash basin with mirror over. Bathroom 1 comprise toilet, large size bath with shower over and full screen. Double wash basin with mirror over, hair dryer. Bathroom 2 comprises toilet, large walk in shower and full screen. Double hand basin with mirror over. FREE USE of the house land line to call any local number. Full air conditioning throughout the house on both levels ensuring your vacation is as comfortable as possible. Air conditioning has a HEAT setting to ensure you stay warm throughout your vacation. Full freshly laundered linen provided for all guests including sheets and covers for the sofa bed conveniently stored away. Large easily operated top loading washing machine conveniently located with in a built in cupboard. Starter supply of powder provided in welcome pack. Again of good size positioned on top of the washing machine for easy access and use. FREE unlimited access to park up to two vehicles directly outside your own vacation home. FREE UNLIMITED WiFi use throughout your vacation. Code available within the welcome pack folder. Ample freshly laundered towels provided including separate coloured towels only for use within the patio area and hot tub. FREE ACCESS to the complex gymnasium which is fully equipped with all the apparatus needed to keep fit during your vacation. Large open plan area with comfortably sofa and two matching chairs. Large floor rug, assorted tables and lamp. Stainless steel dish washer for all the dirty kitchen items. Tablets provided to within welcome pack. Large upright combination refrigerator and freezer with ample storage space. Finished in smart stainless steel. Four ring electric hob set into the beautiful granite counter top. Easily operated controls and smooth clean surface. Built in extractor fan above. Large functional stainless steel built in oven providing ample space to cook and bake. Full glass door provides good visibility and a convenient self cleaning program. Large built in stainless steel micro wave conveniently positioned for easy use. Standard coffee maker finished in stainless steel. Coffee bags provided within welcome pack. Large four slice toaster finished in stainless steel. Complimentary welcome pack consisting of tea, coffee, sugar, bread and butter. Milk, orange juice, eggs and bacon. PLEASE NOTE: these item are only available for guests STAYING for 10 NIGHTS MORE. Ample clean white crockery comprising plates, bowls, cups and glasses. Full range of cutlery and kitchen utensils required. Solid attractive wooden table and six comfortable cushioned matching chairs. All conveniently located within the open plan room design and kitchen area. Large flat screen TV in lounge and master bedroom for all your entertainment. Located in the lounge connected to the main TV. Assorted children's games available in the lounge. Including puzzles and boxed games to entertain your children. Whole holiday complex beautifully landscaped throughout and maintained to a very high standard. The property benefits having a large, fully netted patio. Access through child safety alarmed patio doors for peace of mind. Furnished with comfortable sun loungers, patio set and your own 'Hot Tub'. Hard court available for use located near the club house. FREE ACCESS to the large lake side pool perfectly designed with ample shallow areas for family fun. Ample comfortable sun loungers with matching table and brolly. YOUR VERY OWN HOT TUB conveniently located on your patio for the whole family to enjoy.